Wir haben mehr als ein Jahrzehnt von 5-Sterne-Erfahrungen in unserem Haus in diesem geschichtsträchtigen Viertel zur Verfügung gestellt. Super sauberes, professionell gestaltetes Erlebnis. Nicht auf dem Wasser, aber nur wenige Gehminuten zum Lake Michigan und Muskegon Lake. Komplett mit Bettwäsche, Kochgeschirr und Annehmlichkeiten ausgestattet. Geteilte kostenlose Fahrräder und Kajaks stehen ebenfalls zur Verfügung. A / C und kostenloses WLAN stehen zur Verfügung. Setzen Sie sich an Ihre private Feuerstelle und braten Sie Ihre Marshmallows. Diese Eigenschaft wurde kürzlich komplett renoviert. Wir haben auch ein separates Wagenhaus mit Platz für vier weitere auf dem Grundstück, falls Sie zusätzliche Unterkünfte benötigen. Die Immobilie # 4761321. - Geschirr, Besteck und Töpfe/Pfannen sollen vor Benutzung gespült werden. - Grill (draußen) ist total verdreckt. - Sitzbereich hinter dem Haus ist Durchgangsweg für eine zweite Einheit. We are sorry that your holiday at Charming Redbird Cottage was less than fantastic. We are proud of our home in a friendly, historic, and eclectic neighborhood, and we work hard to make sure that everyone loves it as much as we do. Our guests deserve the best experience, and we will continue to provide excellence and service. . . . . . . . . . . . . . . . . . . . . . . . . . . . . . . . . . . . . . . . . . . . . . . . . . . . . . . . . . . . . . . . . . . . . . . . . . . . . . . . . . . . . . . . . . . . . . . . . . . . . . . . . . . . . . . . . . . . . . . . . . . . . . . . . . . . . . . . . . . . . . . . . . . .
Es tut uns leid , dass Ihr Urlaub im Charming Redbird Cottage war weniger als fantastisch. Wir sind stolz auf unser Haus in einer freundlichen, historischen und eklektische Nachbarschaft, und wir arbeiten hart, um sicherzustellen, dass jeder liebt es so viel wie wir es tun. Unsere Gäste verdienen die beste Erfahrung , und wir werden auch weiterhin Qualität und Service zu bieten. The location is great! Just a couple minute walk to the beach. Also short drive to downtown Muskegon for brewery/pizza, etc. Accomodations nice. Very clean and comfortable. Nice firepit and grill in the back. They were very accommodating; brought us bikes and were available for any questions or concerns. Would stay again without hesitation. With several other properties near by, including a one BR bungalow called Eagles Nest next to this one, we move bikes around to fit needs. Beach cruisers, mountain bikes, road bikes, small bikes, and tricycles are part of our platoon. Bring your helmet as we have some, but not all types. I think there are bike paths all the way to Canada from here. Free for your use. The cottage was everything it was advertised to be and more. Ed is probably the best landlord in West Michigan! Made sure we had what we needed then stayed out of the way. Would recommend both the cottage and Ed to anyone wanting to rent in Muskegon. Very charming cottage. Ed was great and always around if we needed him. The toys he provided kept my kids busy. The fire pit is very relaxing at night. The neighborhood is very quiet with the lake a 2 minute walk to your left and the big lake about a 7 minute walk to your right. I loved sitting on the front porch in the morning and watching the wild turkeys and seeing all the butterflies. There are also deer that come at night behind the house and lots of bats too! My only recommendation would be more towels and toiletries. You go through things faster with kids. 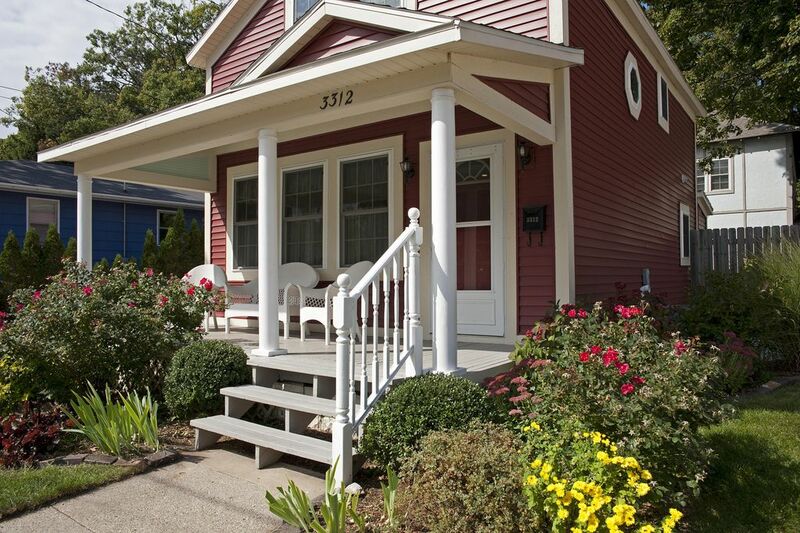 If you are used to new modern rentals, this isn’t the place as it has that upnorth charm. We ate at The Deck- Awesome tacos and views. Always looking to help make a perfect stay, even an extra TP run if requested :). This historic home was remodeled down to the studs about a dozen years ago. We added central air, dishwasher, microwave, hot water on demand, and recently stainless steel appliances, and a keurig. It is professionally decorated and furnished with a french cottage feel, and is a unique visual experience, along with being squeaky clean. Great place to stay! The cleanest rental we have ever stayed in! We would definitely come back. Ed is the perfect host and he really knows how to present a property for vacation enjoyment. All was in good repair and we had all we needed for our Lake Michigan vacation week. The cottage is one block off Muskegon's lakeside bike trail and one day we took a 'round the Lake (32 mile) ride. Each night we took the short walk to the Pier Marquette beach and some evening ate at one of the beach side restaurants. We plan to return each year.